The Sigil of Archers combines symbols of many principles that are dear to our hearts and important to our practice. 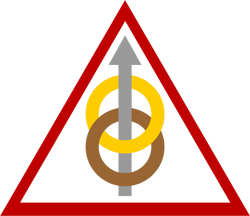 The triangle is the symbol of Fire. In addition, its three sides represent Coven, Circle, and Tradition, each supporting the others, providing form and purpose. The lower circle is Fire of Earth, Malkuth, containing Air, Fire, Water, and Earth. The upper circle is the Universe, the Fire of Sun and Moon. The arrow that moves ever upward is the Personal Fire that connects Earth and the Heavens, on a journey to fill the Cauldron with Energy, Passion, and Balance. Members of Archers wear the Sigil, not only to represent our purpose, philosophy, and coven, but as an anchor to hold the energetic signatures of our rituals, celebrations, and various workings.